Tissamaharama the ancient capital city of the Sinhalese Kingdom of Ruhuna 3rd century B.C houses one of the most sacred sites in Sri Lanka Tissa Great Stupa and Sandagiri Dagoba.The Tissa Wewa lake formed during this period as part of a complicated irrigation system now acts as the ideal habitat for shorebirds. Tissamaharama is the main starting point for YALA, BUNDALA and UDA WALAWE wildlife sanctuaries and the pilgrimage to Katargama sacred to Buddhist, Muslim, Hindu and Veda people alike. known as Yala West or Ruhunu National Park,Sri Lanka's most visited and most rewarding wildlife reserve..
is one of Sri Lanka's foremost destinations for birdwatchers, an important area of coastal wetland famous for..
is one of the best places in Sri Lanka to see elephants. 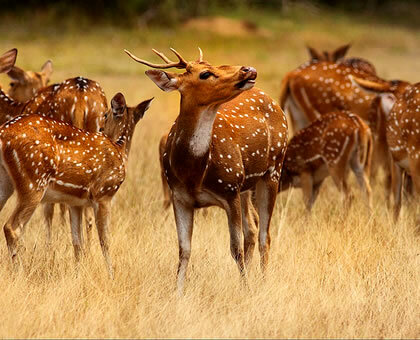 There are about 500 in the park in herds of up to..
YALA NATIONAL PARK known as Yala West or Ruhunu National Park,Sri Lanka's most visited and most rewarding wildlife reserve. Yala covers an area of 1260 square kilometres, four-fifths of this is designated a Strict Natural Reserve. Yala's most famous residents are its leopards – it boasts a higher concentration of these elusive felines than anywhere else in the world. They can be spotted at any time of year and sightings are reasonably common. Very visible are the resident elephants, which can usually be seen on most trips. Other resident mammals include sambar and spotted deer, wild boar, wild buffaloes, macaque and langur monkeys, sloth bears, jackals, mongooses, pangolins, porcupines, rabbits and (rare) wild cats, as well as plentiful crocodiles. 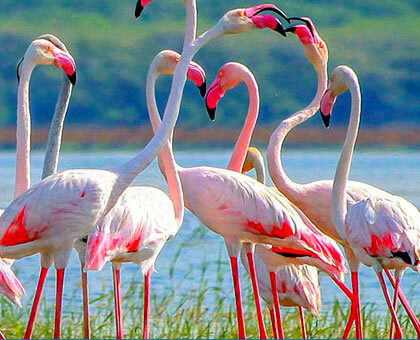 Bundala National Park is one of Sri Lanka's foremost destinations for birdwatchers, an important area of coastal wetland famous for its flocks of greater flamingoes and abundant aquatic (and other) birdlife, as well as being home to significant populations of elephants, crocodiles, turtles and other fauna. 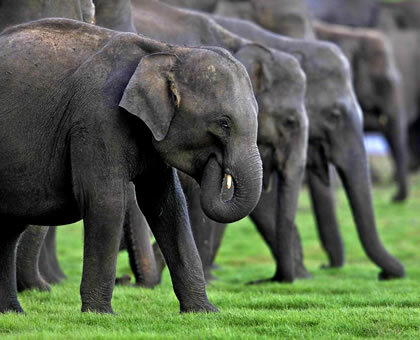 Uda Walawe is one of the best places in Sri Lanka to see elephants. There are about 500 in the park in herds of up to 50 although in other respects it doesn't have the range of fauna and habitats of Yala or Bundala. » Immerse yourself in the calm and spirituality of remote temples Magul Maha Viharaya and Sithulpawwa Rock Temple created in 2nd century B.C.